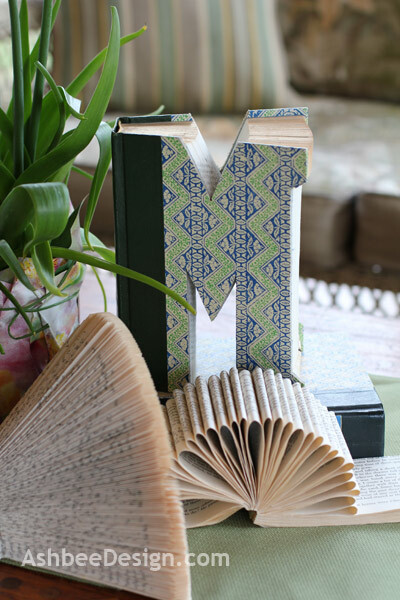 Continuing in my exploration of using vintage books for decor, I experimented with using an old book as the form for a monogram letter. Reader's Digest Condensed Versions seem to be plentiful in the free book market and they have covers with patterned papers and contrasting leatherette bindings. The one I used had gold edges on the top surface of the pages as well. 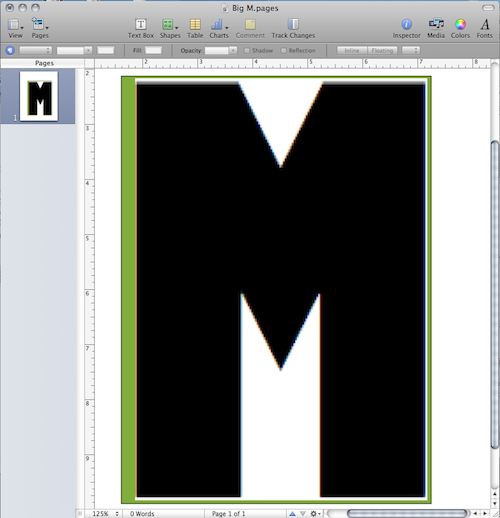 To create the monogram I started at the computer working in the page layout program Pages which is part of the Apple iWork series. Having always used a Mac, working in this program is natural for me but I expect similar things can be accomplished in MSWord as well. First I explored different fonts looking for one that had a big bold M. You do need to consider letter choice for this project. This type of book monogram only works with letters that have a straight left side. M is perfect as is B, D, E, F, H, K, L, N, P, and R. Others can be created if you used a squared-off font. Letters like A, C, G, O, Q, U, W could be modified. Letters like S, T, X and Z will prove challenging. And different fonts handle each letter differently. I liked the Gill Sans Ultra Bold uppercase M because the middle didn't descend all the way to the floor. For other letters I might choose a different font. Once I had my desired letter I took a screen shot of it - (Command-Control-Shirt-4 key combination on a Mac) and pasted that as a jpg (not text) into a new layout document. In this new document I drew a rectangle the same size as my book. 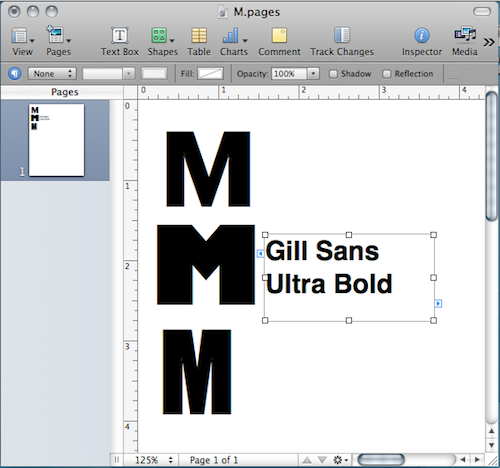 I then stretched the jpg letter until it matched the size of my book. By changing the font into a jpg I could stretch to a different proportion than the font design. I needed it to be taller than a classically proportion M.
The green rectangle was the size of my book. 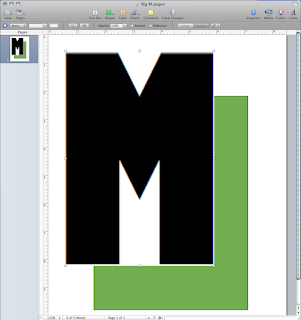 I stretched the M to fit it and then slid it over the rectangle. I printed the M and taped it (using removable tape) to my book. Working on a band saw, I carefully cut along the edges of the letter. When done, I removed the paper template and the book was done! I did decide to cut in on the right side adding a little serif to the font. Few projects are as easy as this one! Looks like I am getting tons of visitors here from Pinterest today. Welcome! I encourage you to browse around for a while. Check out the links below to other book type ideas. If you are a DIYer then be sure to check out my Tutorial tab above. I am an active blogger that posts about many creative topics although recently I have completed some popular craft projects. I encourage you to follow my blog and get the regular updates or follow me on Pinterest because I do post my new projects there as well. Stay in touch and share your projects with me. Have a wonderful, creative day. 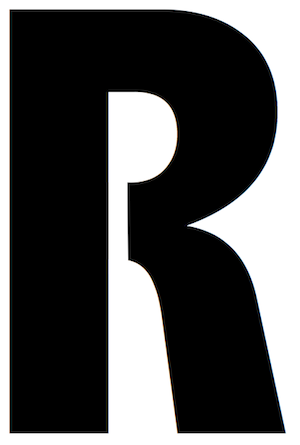 Here is an example of an Upper Case R re-deisgned to be accessible with a band saw. It would be stronger if you used a drill press and scroll saw to cut out inner spaces but if you are lacking the tools this solution might work for some letters. O is tough though! You sure make it look easy, but I know most of us do not have your skills! Love the whole display- well done! Thanks for commenting. I look forward to your regular comments. On this project it really was easy. The only part that makes so most can't do it is having a band saw. I am lucky because my husband is a sculptor and has a wood shop. The band saw is a great tool to have access to. I have to be sure to completely clean up my mess though! Thanks for taking the time to comment. What a creative idea! I love the look of this so much! It would be great if you would like to stop by and share this at our link party http://herestohandyandy.blogspot.com/2012/04/pinteresting-link-party-week-35.html#more. I love it! Just yesterday I saw the most wonderful monogram letter, all covered in yarn. And now I've found an even more interesting one! That's really great ... I wish I had a band saw. I'll have to find a friend who does. I love the above comment about using it as a guest book ... such a fun idea! What a great idea - I have a huge stack of cute Reader's Digests just waiting to become something. I have been stuck on what to actually do with them though. Love this idea - if only I had a band saw! Maybe I will play around with the saws we do have and see what I can do. Thanks for sharing! Thanks for commenting. Let me know if you are successful with something else. Then we can share the idea because most people don't have access to a band saw. Maybe I'll try one on the smaller jig saw today. Send pictures! I love this. You did an awesome job. I'm going to have to ask around and see if anyone has a band saw. I love this! Usually, I am not for destroying books but those Reader Digest ones are pretty useless otherwise! Agreed! But the patterned covers work nicely for this project! Band saws require paying attention - as do all power tools - but I find it much safer than a table saw. Thanks for commenting. This is so awesome. I am obsessed with books and one day I hope to have a whole library room. (A girl can dream!) Can't wait to try this out. I have always loved books but have reached a point where there just isn't enough space for all of them. We have been donating books to our library for years now. Thinned the collection by at least 75% and still have hundreds - a lifetime of books! thanks for commenting Jessica. This is such a cool idea! Would make a lovely wedding gift. It would as long as the initials are the correct letters. Don't think this would work with J! 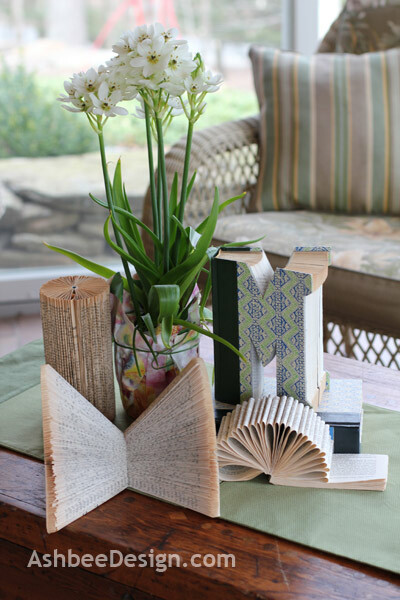 The idea could also be used as centerpieces at a wedding with a literary theme. Awesome! The pattern on the book really makes it pop. Very unique. Thanks for visiting and commenting. I am lovin' Pinterest today! It is sending lost of people here! Super, super cute! Love it!!! Thanks for sharing! Very cute idea. Clever, creative, unique. Love it! I do not have these tools available to me and I bet lots of other people are like me. That said, you should sell these on Etsy. I'd be first in line! I will be 2nd in line!!! Our last name is Massey!!! I have seen these and wondered how they were made. Thanks for the tutorial! Love it! What a great project. Wish I had a band saw!! Such an awesome project! I'll have to keep this idea in mind... thanks for the inspiration! I saw this over at C.R.A.F.T. And followed the link...I always find really cool journals, mainly unused. I'm thinking about doing this to one of those as a baby/wedding gift and making scrap book like inside for first this or that where they can fill it in. Or, have guests write something in it. Thanks for the push for another craft to start on! really do LOVE this!!! My son asked for a scroll saw last Christmas, so I am SET!!! Thanks for sharing your creativity!! You inspire! What a clever idea! I've admired all the book art projects but this is my favorite! I wondered how hard it would be and when I realized it was a saw, I was thrilled...I can do this too! Thanks so much for sharing at The Shady Porch! Thank you everyone for taking the time to visit and comment. I guess I need to think up some more book ideas because it sure is a popular topic. Next time I'll try for one not requiring a band saw. Has anyone ever visited one of those rent-a-shop locations where you can rent time on a band saw? I've never seen one but I hear they exist in cities- ( I am not in a city!) Wonder if they would allow you to cut books? Anyhow, stay tuned, start following and I'll keep sending ideas your way! My husband and I just made two of these monogrammed letter books today for our granddaughters. We made an E and a M. I placed the letters that I made on the computer onto the books and my husband, (God Love 'Em) cut the books out with the band saw. I am going to cut scrapbook paper in the shape of the letters and modge podge them onto the front and back of the book I used. Thanks so much for such a great idea! These things might even become Christmas gifts for family and friends. Hmmm....just gotta get the books! Judy, do you have a picture up anywhere that I can see? So glad to have inspired you. I am thinking of making a set for my brand new grand daughter for her nursery. Seen this on Pintrest, I LOVE them & actually have access to a ban saw!! My question is what tool do you use to cut out middle for letters such as-A R B O D?? I would use a drill press to drill a hole and then a scroll saw to cut our the interior space. Or I would design the letter in a contemporary font that allows for access for a band saw. 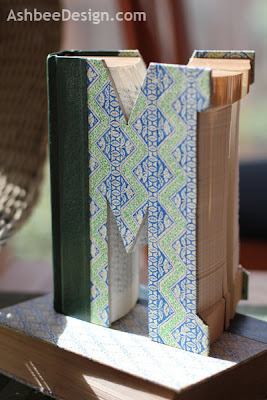 I'll put at image into the blog post as an update giving and example of this with the upper case R.
Your monogram book turned out great - thanks for posting the tutorial and I have this linked to my books project post as well today! Love, love, love this!!! My last name is a "W" so I'll have to play with it. Thanks for linking up to TT&J! Has anyone tried this with a jig saw? Just created my own using your tutorial as inspiration. 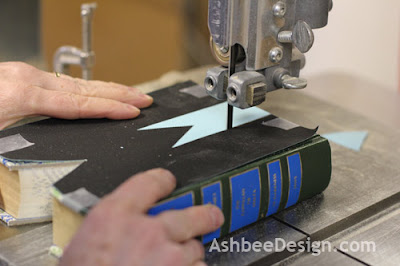 Sadly, we didn't have a band-saw and had to create our own way of cutting a book into a "C"
How on earth did you get the covers to be larger than the pages....like a real book? I don't see how the band saw could do this. How did you do it? It is a real book! I started with a Readers Digest Condensed book because of the attractive cover and just cut away! Wow! This project is so good. I love making new things from old ones specially books. You can do so many new projects from them. Your post has worked as an inspiration. I want you to have a look at this amazing book by Altered Upcycling. It shares many new projects too. I am thinking of getting a band saw for my hubby's bday...self motivation to make these letters for our sons Christmas gift! Can you tell me what kind of Band saw you used...motor amp(?) size etc. This is so cool and I love your tutorial. I found you through Pinterest. I have a question on how you cover the raw cut edges of the book cover so that they match the front. Roberta, the books I choose are the Readers Digest series. I chose them because the covers come that way. They are readily available in used book shops or swap shacks.